Not to be confused with The Blade (film). Blade is a 1998 American superhero film directed by Stephen Norrington and written by David S. Goyer based on the Marvel Comics character of the same name. The film stars Wesley Snipes in the title role with Stephen Dorff, Kris Kristofferson and N'Bushe Wright in supporting roles. In the film, Blade is a Dhampir, a human with vampire strengths but not their weaknesses, who protects humans from vampires. Released on August 21, 1998, Blade became a commercial success by grossing $70 million at the U.S. box office, and $131.2 million worldwide. Despite mixed reviews from film critics, the film received a positive reception from audiences and has since garnered a cult following. It is the first film in the Blade franchise, followed by two sequels, Blade II and Blade: Trinity, both written by Goyer who also directed the latter. Blade was a dark superhero film for its time. The success of Blade began Marvel's film success and set the stage for further comic book film adaptations. Thirty years later, in 1997, the child has become the vampire hunter Blade. He raids a Los Angeles rave club owned by the vampire Deacon Frost. Police take one of the vampires to the hospital, where he kills Dr. Curtis Webb and feeds on hematologist Karen Jenson and escapes. Blade takes Karen to a safe house where she is treated by his old friend Abraham Whistler (Kristofferson). Whistler explains that he and Blade have been waging a secret war against vampires using weapons based on their elemental weaknesses, such as sunlight and silver. As Karen is now "marked" by the bite of a vampire, both he and Blade tell her to leave the city. Upon returning to her apartment, Karen is attacked by police officer Krieger, who is a "familiar", a human slave controlled by a vampire. Blade subdues Krieger and uses information from him to locate an archive of vampire history. Later, at the hideout, Blade injects himself with a special serum that prevents him from succumbing to his desire to drink blood. However, the serum is beginning to lose its effectiveness due to overuse. Krieger informs Frost of what happened, and Frost kills and eats Krieger. While experimenting with the anticoagulant EDTA as a possible replacement, Karen discovers that it explodes when combined with vampire blood. She manages to synthesize a vaccine that can cure the infected, but learns that it will not work on a human-vampire hybrid like Blade. Karen is confident that she can cure Blade's bloodthirst but it would take her years of treating it. Frost and his men attack the hideout, infect Whistler, and abduct Karen. When Blade returns, he helps Whistler commit suicide and arms himself with special syringes filled with EDTA. When Blade attempts to rescue Karen from Frost's penthouse, he is shocked to find his still alive mother, who reveals that she came back that very night and was brought in by Frost, who appears and reveals himself as the vampire who bit her. Blade is then subdued and taken to the Temple of Eternal Night, where Frost plans to perform the summoning ritual for La Magra, the vampire blood god. Karen is thrown into a pit to be devoured by Webb, who has transformed into a decomposing zombie-like creature. Karen injures Webb with a sharp bone and escapes. Blade is drained of his blood, but Karen allows him to drink from her, causing him to recover. Frost completes the ritual and obtains the powers of La Magra. Blade confronts Frost after killing all of his minions, including Blade's mother. During their fight, Blade injects Frost with all of the syringes, causing his body to inflate and explode, killing him. Karen offers to help Blade cure himself, but he asks her to create a new serum instead. In a brief epilogue, Blade confronts a vampire in Moscow. Wesley Snipes as Eric Brooks / Blade: A half-vampire "daywalker" who hunts vampires. Blade is highly skilled in martial arts and always equips himself with vampire-killing weapons. N'Bushe Wright as Dr. Karen Jenson: A hematologist who is bitten by a vampire. She stays with Blade to remain safe while she finds a cure for herself. Stephen Dorff as Deacon Frost: An upstart vampire with great ambitions and influence. He emerges as Blade's primary enemy and also wants to conquer the human race. Kris Kristofferson as Abraham Whistler: Blade's mentor and weaponsmith. Donal Logue as Quinn: A cocky minion of Frost's, capable of surviving wounds that kill lesser vampires. Udo Kier as Gitano Dragonetti: A vampire elder. Sanaa Lathan as Vanessa Brooks: Blade's mother, who has become a vampire. Arly Jover as Mercury: A fleet-footed vampire and Frost's lover. Kevin Patrick Walls as Officer Krieger: A "familiar", or human servant, of Frost's. Tim Guinee as Dr. Curtis Webb: Karen's ex-boyfriend who later becomes a decomposing vampire. Traci Lords as Racquel: A seductive vampire who leads a man to the blood rave. Marvel Studios had developed the film as early as 1992, when rapper/actor LL Cool J was interested in playing the lead role. Blade was eventually set up at New Line Cinema, with David S. Goyer writing the script. According to Goyer, New Line originally wanted to do Blade as "something that was almost a spoof" before the writer convinced them otherwise. After failing to get a Black Panther film into production, in 1996 Wesley Snipes signed on to star as Blade. When Goyer first pitched the idea of doing a Blade film, the executives of New Line felt there were only three actors who could possibly do the role: Snipes, Denzel Washington, and Laurence Fishburne, but to Goyer, Snipes was always the perfect choice for Blade. Marc Singer was the original choice for Whistler. Jet Li was offered the role of Deacon Frost but opted to do Lethal Weapon 4 instead. Bruce Payne was also considered for the role of Frost. Blade was produced on a budget of $45 million and principal photography commenced on February 5, 1997, in large part done in Los Angeles, with some scenes being shot in Death Valley. All sets were constructed, and all on-set filming occurred, in what was formerly the Redken Shampoo factory in Canoga Park. The effects for the film were done by Flat Earth Productions. A soundtrack containing hip hop music was released on August 25, 1998 by TVT Records and Epic Records. It peaked at #36 on the Billboard 200 and #28 on the Top R&B/Hip-Hop Albums. The British techno band The Prodigy were approached to do the soundtrack and score to the film but had to turn down the offer due to other commitments. The character Blade was created in 1973 for Marvel Comics by writer Marv Wolfman and artist Gene Colan as a supporting character in the 1970s comic The Tomb of Dracula. The comic Blade used teakwood knives and was much more the everyman in his behavior and attitude. Though courageous and brave, he displayed flaws as well, such as an inability to get along with certain other supporting cast members and a hatred of vampires that bordered on fanaticism. The character was not originally a "daywalker" but a human being immune to being turned into a vampire. Lacking the superhuman speed and strength of his undead quarry, he relied solely on his wits and skill until he was bitten by the character Morbius as seen in Peter Parker: Spider-Man #8, first published in August 1999. The film portrayal of Blade was updated for a 1990s audience and the comics character was subsequently modified to match. The film's version of Deacon Frost also differs greatly from his comic counterpart. Although the movie retains Frost's upstart ambitions, he was a great deal younger and more updated for the 1990s. Blade was Marvel's first box office success, and set the stage for further comic film adaptations. Blade followed the disastrous Howard the Duck as the second Marvel property to get a wide theatrical release in the United States. The Punisher and Captain America both had films made previously, but neither saw a theatrical release in the United States. The film went to number one in both Spain and Australia for their opening weekends. With 200 theatres showing the film, Spain's filmgoers earned the film $1.5 million (US) in three days, whilst Australia earned $1 million from 132 cinemas showing the film. In the Flemish Region of Belgium, the film earned $323,000 from 20 cinemas, and the Netherlands earned the film $246,000 from 44 cinemas. France made $1.9 million in five days from 241 cinemas, but the film was less successful in Hong Kong (with $182,000 from 22 cinemas) and South Africa ($159,000 from 64 cinemas). The United Kingdom was more successful, taking in $5.7 million over 10 days, as was Brazil, making $855,000 in four days from 133 cinemas. The film was banned from showing in Malaysia, widely considered to have the most controlling censors in Southeast Asia. On review aggregator Rotten Tomatoes, the film holds a 53% positive rating based on 95 reviews, with an average rating of 5.7/10. The site's consensus reads, "Though some may find the plot a bit lacking, Blade's action is fierce, plentiful, and appropriately stylish for a comic book adaptation." On Metacritic the film has a score of 45/100 based on reviews from 23 critics. Audiences polled by CinemaScore gave the film an average grade of "A-" on an A+ to F scale. 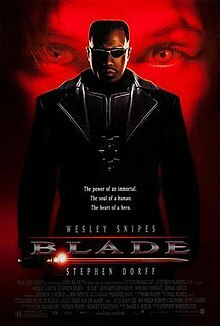 Roger Ebert gave the film 3 stars out of 4, writing: "Blade ... is a movie that relishes high visual style. It uses the extreme camera angles, the bizarre costumes and sets, the exaggerated shadows, the confident cutting between long shots and extreme closeups. It slams ahead in pure visceral imagery." James Berardinelli gave the film 2½ stars out of 4, writing: "Blade has the capacity to dazzle, but it also will leave many viewers dissatisfied." Critics such as A. Asbjørn Jøn have noted not only the important place of Blade in the wider vampire genre but also possible intertextual links between the Whistler character and a character named Whistler in A Dozen Black Roses (1996) by Nancy A. Collins, as they possess "striking similarities in role, dramatic focus, visual appearance, and sharing the name". Marv Wolfman unsuccessfully sued Marvel, New Line, and Time Warner for $35 million after the release of the film, claiming he was not bound by a work for hire contract when he created the character in 1972. He, along with artist Gene Colan, received a "based on characters created by" credit in this film, but did not receive a credit in Blade II or the TV series. A video game based on the movie was published and released by Activision in 2000. In August 2014, Snipes spoke about his desire to return to the franchise, telling MTV.com, "I'd be open to it. I think we've got some stones left unturned and there's some latitude left for us to build on and I'd love to get back in the suit again and do some things I've learned how to do now that I didn't know how to do then." ^ "BLADE (18)". British Board of Film Classification. September 18, 1998. Retrieved April 29, 2015. ^ a b c Allstetter, Rob (August 1997). "Special Report: Blood on the Big Screen". Wizard (72). pp. 122–3. ^ Turan, Kenneth (6 November 1992). "Blade to Snipes' Heat". The Los Angeles Times. Retrieved 2010-09-21. ^ Lichtenfeld, Eric (2007). Action Speaks Louder: Violence, Spectacle, and the American Action. Wesleyan University Press. p. 289. ISBN 0-8195-6801-5. ^ "An unsung hero: How Blade helped save the comic-book movie". Blastr.com. Retrieved November 11, 2014. ^ "5 Lessons Blade Taught Studios About Superhero Movies (They Have Clearly Forgotten)". Whatculture.com. Retrieved November 11, 2014. ^ Staff (1992-12-08). "Marvel characters holding attraction for filmmakers". Variety. Retrieved 2014-10-12. ^ Gary Levin (1996-12-29). "Perelman takes Marvel to bankruptcy court". Variety. Retrieved 2014-10-12. ^ Michael Fleming (1997-01-27). "Hughes Bros. Turn out 'Pimp'". Variety. Retrieved 2014-10-12. ^ Bashirah Muttalib (8 October 1998). "As more pics shoot in Calif., coffers swell". Variety. Retrieved 13 December 2008. ^ Marc Graser (1 October 2001). "Flat Earth founder forms new company". Variety. Retrieved 13 December 2008. ^ staff. "BLADE test screenings". ^ Don Groves (13 October 1998). "Germans embrace 'Ryan' at the B.O." Variety. Retrieved 13 December 2008. ^ Don Groves (3 November 1998). "'Antz' swarming o'seas". Variety. Retrieved 13 December 2008. ^ Don Groves (9 November 1998). "'Antz,' 'Exorcist' impressive o'seas". Variety. Retrieved 13 December 2008. ^ Don Groves (24 November 1998). "'Mary,' 'Whisperer' top $100 mil mark o'seas". Variety. Retrieved 13 December 2008. ^ Don Groves (5 November 1998). "'Ryan' under attack". Variety. Retrieved 13 December 2008. ^ "Blade Movie Reviews, Pictures". Rotten Tomatoes. Retrieved March 28, 2019. ^ "Blade (1998)". Metacritic. Retrieved February 4, 2019. ^ "Blade :: rogerebert.com :: Reviews". Rogerebert.suntimes.com. 21 August 1998. Retrieved 2011-01-06. ^ "Blade - Reelviews Movie Reviews - James Berardinelli". Reelviews.net. Retrieved 2011-01-06. ^ Jøn, A. Asbjørn (2003). "Vampire Evolution". mETAphor: 23. Retrieved 25 November 2015. ^ Marla Matzer (August 21, 1998). "Blade Suit Seeks Slice of the Action for Its Creator". LA Times. ^ "Gamespot.com: Blade for PlayStation". Retrieved 2009-07-21. ^ "Wesley Snipes back for fourth 'Blade'". Toronto Sun.